Sunday, I traced out the trouser pattern from Vogue 8940 and made a muslin, and I’m back to report my first attempts at fitting them. It has slant pockets in front. In back it does not have welt pockets, as I first guessed. 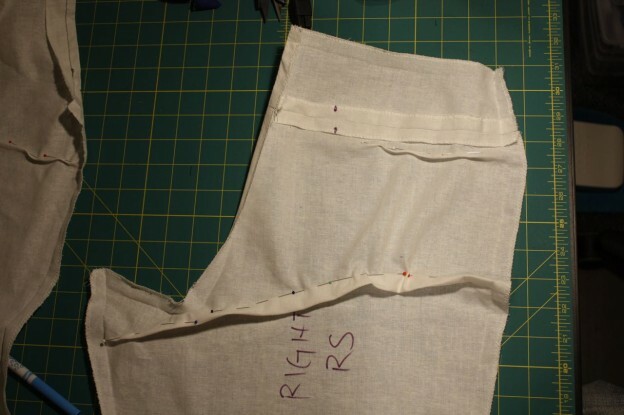 The rear pockets are on-seam pockets, using the yoke seam. The rear pockets are covered with flaps. Unlike the Jedediah pants, V8940 has a contoured waistband with overlap and underlap extensions across center front. The pattern comes in two multisize editions: 34-36-38-40, and 40-42-44-46. I have both editions, so all bases are covered. This entry was posted in Pattern Fitting, Trousers and tagged vogue-8940 on December 31, 2014 by mportuesisf. Pants for Real People, the Palmer/Pletsch book on pants fitting. Vogue Fitting, a book from the ’80s with a chapter on pants fitting. Fabulous Fit, a modern book featuring the seam method of pattern alteration. I’ve also been spending some time with my copy of the Threads Magazine DVD Archive looking for articles on pants fitting. The Threads DVD Archive has to be one of the best sewing instructional purchases I’ve made; there’s literally hundreds of articles in there I find fascinating. It was difficult for me to look through the archive because I kept running into the temptation to go off on a tangent looking at some other interesting article. What’s more, the magazine issues are all standard PDF files, without copy protection, so it’s straightforward to copy them onto a tablet or similar device for ease of reading. Thank you Threads magazine for trusting your readers. This entry was posted in Books, Pattern Alteration, Pattern Fitting, Reviews on December 27, 2014 by mportuesisf. I really appreciate all the constructive critical feedback I received in my previous article on pants fitting. I value the critical feedback every bit as much as I do the “Great work!” style comments, because they truly help me learn and get better as a sewist. So thank you to everyone who took the time to leave a comment. 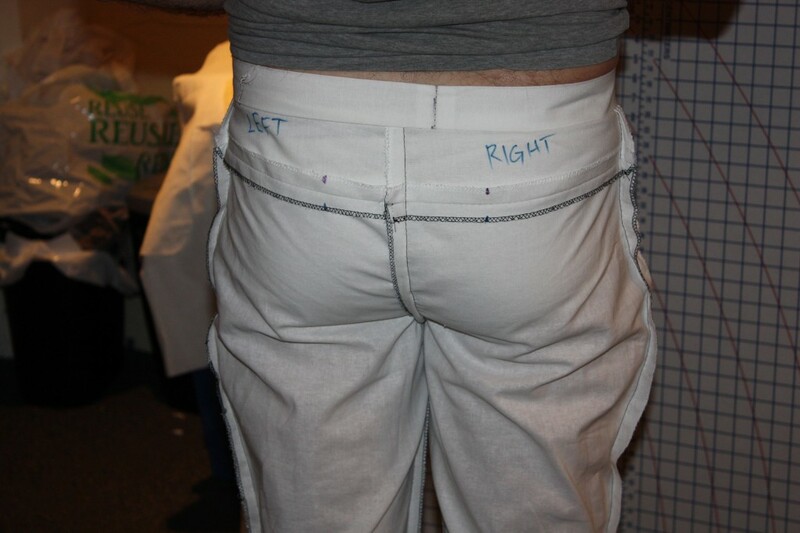 Last time, I had promised to show you the photos of the latest rounds of fitting on the Jedediah Pants pattern. Picking up where we left off, this photo shows the fitting session after I added the wedge of fabric back into the crotch seam, at the top of the pants back and just below the yoke piece. I took the liberty of adding a waistband to get a better feel for how the waist hangs in back. I also added a zipper in front to make the fitting easier. This entry was posted in Pattern Alteration, Pattern Fitting, Patterns, Trousers and tagged Jedediah-pants on December 22, 2014 by mportuesisf. I have started a new project; pants based on the Jedediah Pants pattern from Thread Theory Designs. This “new” project is actually a continuation of the “Breakfast Club Wardrobe” project, though since it had gone on for so long I’m splitting it into two projects: the shirts (completed) and now the pants. Given the amount of effort involved in producing a hand-made garment, I’ve come to realize that the effort is wasted if the fit and style aren’t also right. So I’m really trying to get the fit right before making three pairs of pants based on the pattern. This entry was posted in Pattern Alteration, Pattern Fitting, Trousers and tagged Jedediah-pants on December 14, 2014 by mportuesisf.